What scares you? A haunted house with creaking stairs? A ghostly apparition flitting through the forest? A vampire rising from its grave as the clock strikes twelve? Or maybe a spider scuttling across the floor giving you the evil eye? When writing a scary story you can turn your own fears into fiction and give your readers a fright! Your story could have the usual scary suspects – ghosts and zombies, werewolves and monsters – or you could add a supernatural twist to an ordinary object, such as a cursed smartphone with an app that can bring the dead back to life! Use your imagination and graphic descriptions to build your own spine-chilling tale. We have a wide range of words for you to help you make your writing more powerful. Which words from this web could you use to describe the characters, settings and events of your scary story? 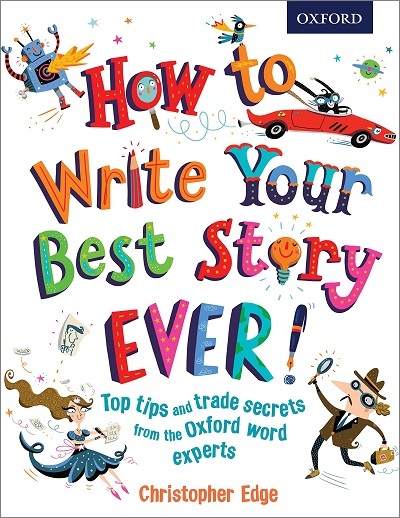 Packed with entertaining illustrations that will inspire your child, this book is filled with tips on how to write in particular genres, create exciting characters, and write powerful sentences using metaphors, similes, and idioms.